Would you believe a year has passed (give or take a couple of weeks) since The Man Bird and I visited The Orangery at Audley St Elphins Park in Darley Dale? I know, neither could we! But a quick look in the trusty old pink book confirmed that this was indeed the case. As we walked through the reception doors though, that lovely inviting vibe was still there and the lady behind the desk gave us a wonderfully warm welcome. We popped our coats in the cloak cupboard and were then escorted through into the bistro to meet the manager on duty that evening, Fiona. I still love the decor in the Bistro; it’s an absolutely fantastic space that is modern, but not at all garish. 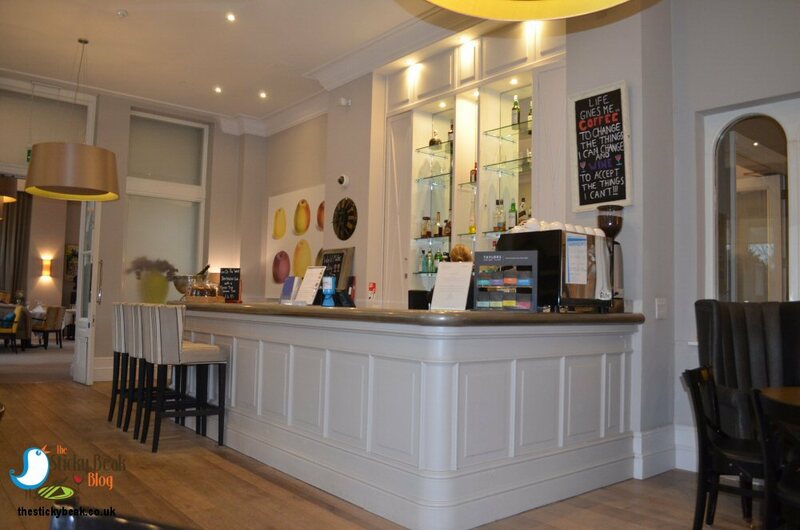 It houses a sleek bar that is amply stocked with all kinds of great tipples and a rather magnificent looking coffee machine :) We took a seat on a couple of squishy chairs to look through the wine list; I fancied a glass of Claret (can’t recall the last time I had Claret! ), and His Nibs chose a New Zealand Sauv Blanc – nice. We savoured the wine carefully, making the most of the relaxed atmosphere. Some of the complex’s residents had dined early and were heading back to their apartments to watch the Masters’ Golf on TV, but there were still a couple of tables occupied as we headed through at 7pm. 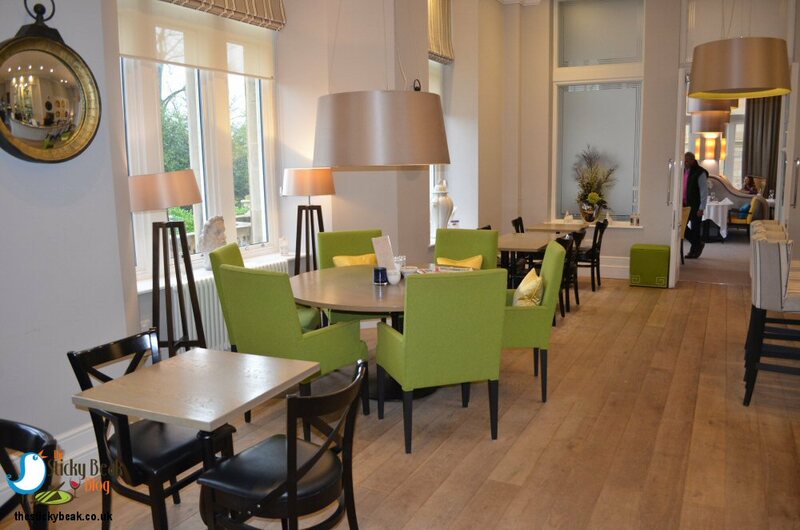 You can’t help but admire The Orangery restaurant with its refined, elegant-yet-contemporary decor. It isn’t just the statement artwork and ceramics in the venue that captures your attention; egg-yolk yellow velvet chairs at some of the tables are stunning to behold and this warm accent is followed through by the honey-hued lighting. What I really love though is the fact that you don’t have to be resident at St Elphins Park to take advantage of this magnificent setting! Seriously, you can walk in for a relaxed lunch or afternoon tea in the Bistro (or on the garden terrace overlooking the croquet lawn if the weather is playing nicely! 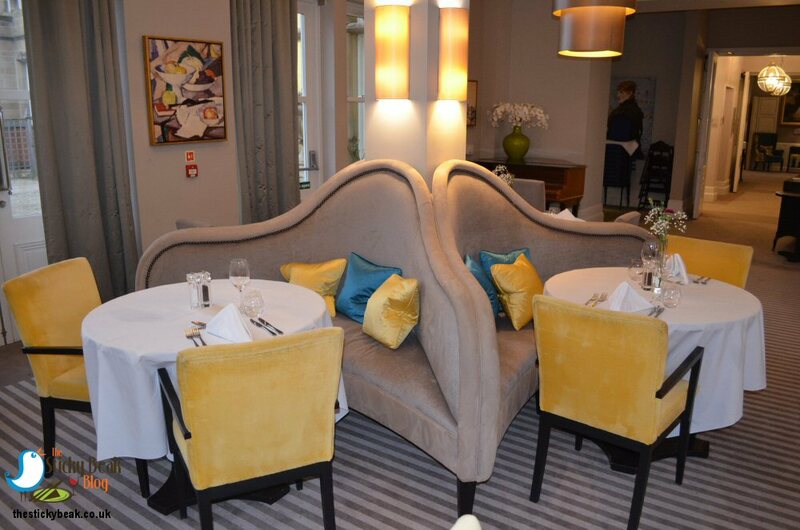 ), or indulge in a superb dinner in The Orangery. 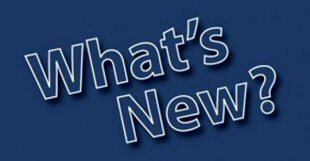 Midweek, the evening menu is the classics/favourites selection which includes meals such as Fish and Chips, Gammon, Scampi etc; Saturday evening sees the a la carte menu make its appearance, and this changes weekly. 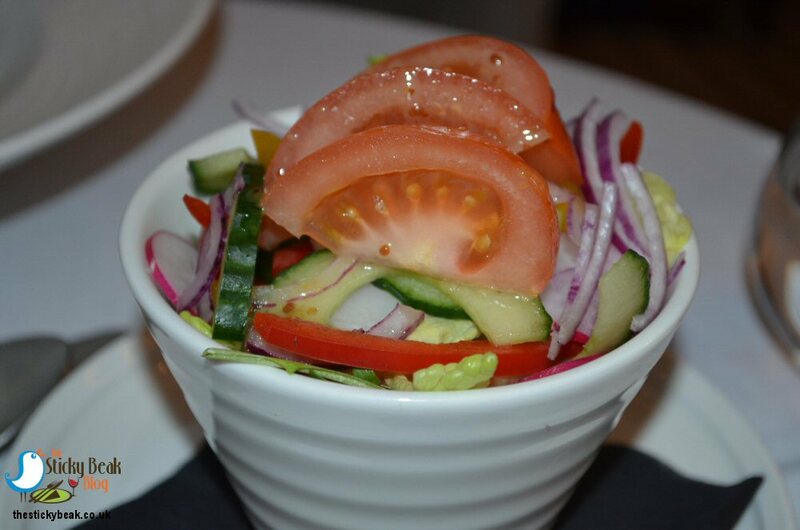 When we went, the a la carte starters ranged from £5.95-£6.95, mains £15.95-£17.95, sides all £3, and puddings £3.50-£5.95. The cheese selection was £7.95. I think there is perhaps a perception that it would be a little pricey, when in fact this couldn’t be further from the truth. The quality and quantity of the dishes is very good too, something that maybe is under-estimated. Anyhow, what I’m saying is you don’t have any excuse not to go and try it for yourself!! 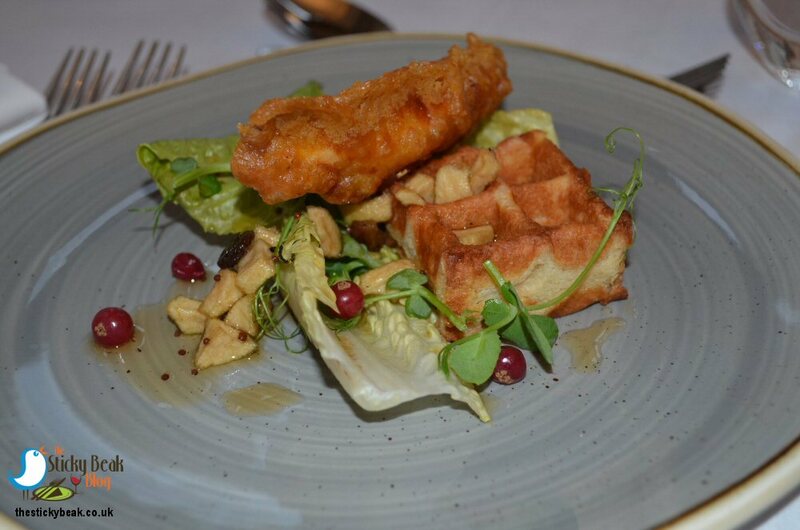 To kick things off I ordered Candy Beetroot salad with roasted Feta cheese, pine nuts, olive Croute, and pea shoots; The Boy Wonder had the Southern fried Chicken and Waffle with Maple and Apple chutney and scorched leaf. As well as the exceedingly charming Fiona, we were being hosted by the delightful Sophie - between these two capable young ladies every single aspect our evening was taken care of. The other diners in the restaurant were receiving top notch service too; the chatter, laughter and empty plates carried away from the tables were clear testament to this fact. My candy Beetroot was gorgeously sweet-yet-sharp and had a great crunch to it, despite it being thinly sliced. I had plenty of texture to appreciate too, thanks to the Pine Nuts and Olive Croute. Feta cheese has that distinctly sharp note to it, and its gentle roasting had brought this even more to the fore. Fresh clean flavours came via the Little Gem Lettuce and pea shoots; the overall effect was one of a light, enticing starter that set the scene for more deliciousness ahead. As well as our glasses of wine, Sophie had brought over some chilled water for the table and checked that these were still suitably filled as she took our plates away. This slick, almost ninja level of attention to guest comfort isn’t commonplace nowadays, but both Sophie and Fiona have it off to a fine art. If there were Olympic medals in “stealth service” these ladies would win! .Fiona came to enquire if we’d enjoyed our first courses and was telling us that The Orangery are increasing their commitment to using locally sourced, seasonal produce, something that is always nice to hear. 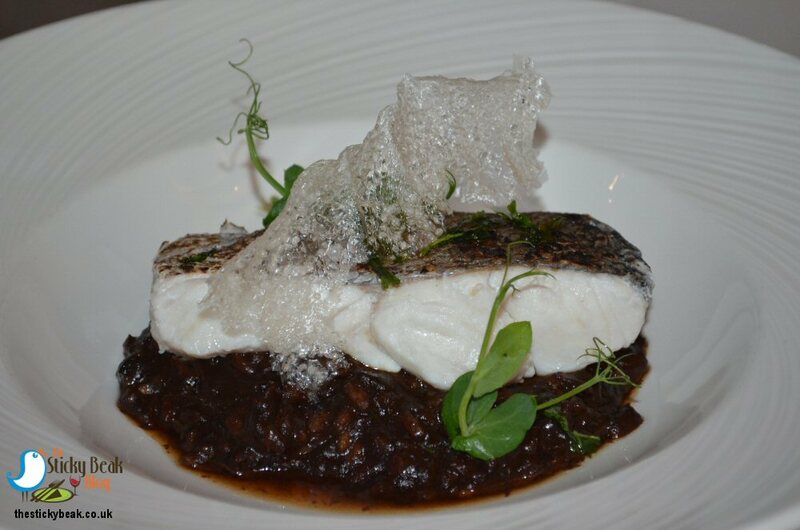 I am rather partial to fish as you know dear reader, so I selected the Buttered poached Hake with Black Garlic and Rocket Risotto, Tapioca crisp, and Lemon oil. It isn’t like The Man Bird to dilly-dally over his choice, but he really couldn’t decide between the Pork steak and the Confit Duck Leg. A quick coin toss settled the debate; Duck it was! 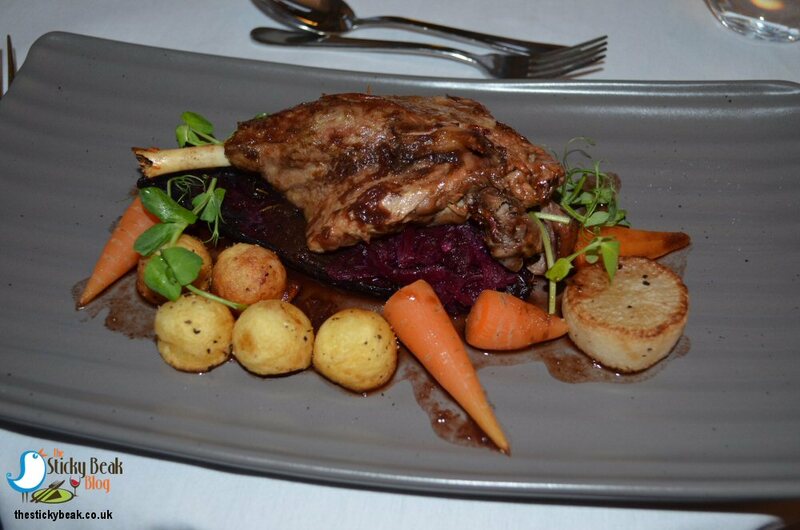 This meal comes with braised Red Cabbage, parmentier Potatoes, Mooli, Heritage Carrots, and red wine jus. Honest to goodness, neither of us has seen a duck leg quite as big as the one from the kitchens at The Orangery, it was massive! The ethos to keep things uncomplicated at St Elphins Park paid off in this instance; the pure, unadulterated flavour of the duck shone through and the meat fell cleanly away from the bone. A whisper-light tang came from the braised cabbage which contrasted marvellously against the sweetness of the carrots in all their multi-coloured glory. Mooli, or Daikon, is a type of radish that has a somewhat bipolar character – managing to be both sweet but slightly spicy simultaneously. 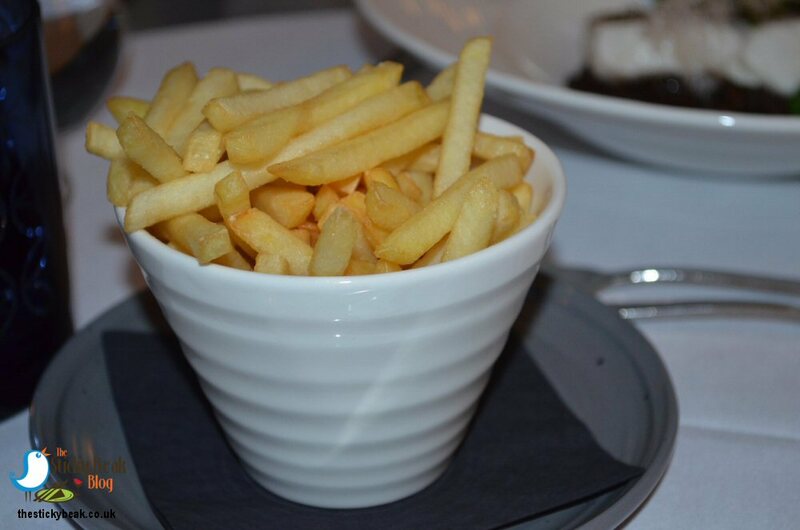 Gorgeous bite-sized parmentier Potatoes had delicately crisp outers and uber-soft inners; sublime. A lovely thick fillet of poached Hake sat atop a deep earthen-toned risotto which was adorned with a beautiful, opaque Tapioca crisp in an artful shape. I just love the substantial meaty texture of Hake, and this was a prime example of that; factor in its delightful sweetness, and you can imagine how gleeful I was as I tucked into it! Normally, the risotto’s I encounter are pale in colour and have wine or chicken stock as their base, but the inclusion of Black Garlic gave this one a deep colour. Being the greedy guts’ that we are, we’d also ordered sides of mixed leaf salad and Bistro fries! The fries were surprisingly good, even down to the last one; they didn’t go soggy at all, they weren’t greasy, and they’d been lightly seasoned, so they tasted perfect. 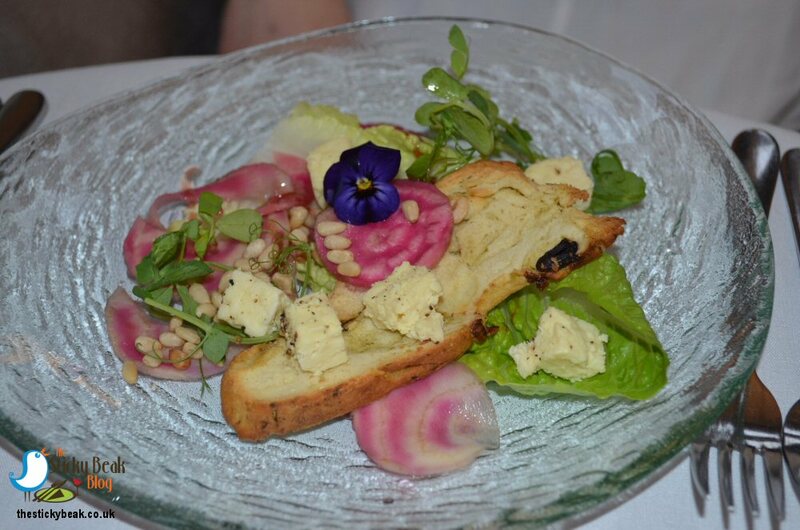 For a side salad, the one at The Orangery doesn’t muck about; it has red onion, peppers, de-seeded Cucumber half-moons, and sliced Radish in it, as well as the salad leaves and rocket. A light dressing topped it off very pleasingly, and it got polished off in double-jig time. Pudding beckoned, and with absolutely zero will-power between the pair of us, it was inevitable that sweet treats would be making an appearance at our table! Unusually, I was the one that ordered the Hot Chocolate sponge with Fudge and Vanilla sauce, and Malt Ice Cream - normally it’s The Boy Wonder that makes a bee-line for the Chocolate option. It was a serious case of déjà vu; His Nibs really couldn’t decide between two puds. 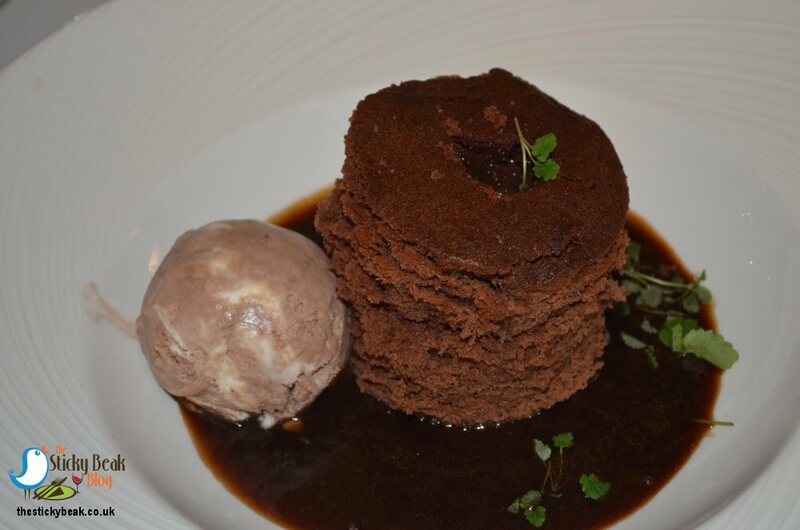 Never mind it being called soufflé, skyscraper would be more accurate. This (not so) little minx was heading for the stars - until His Nibs dived in with his spoon and thwarted its thoughts of astral glory! The Banana hint was gossamer fine and perfectly sweet to taste; the caramel was correspondingly delicate and so the effect was one of harmony on the palate. 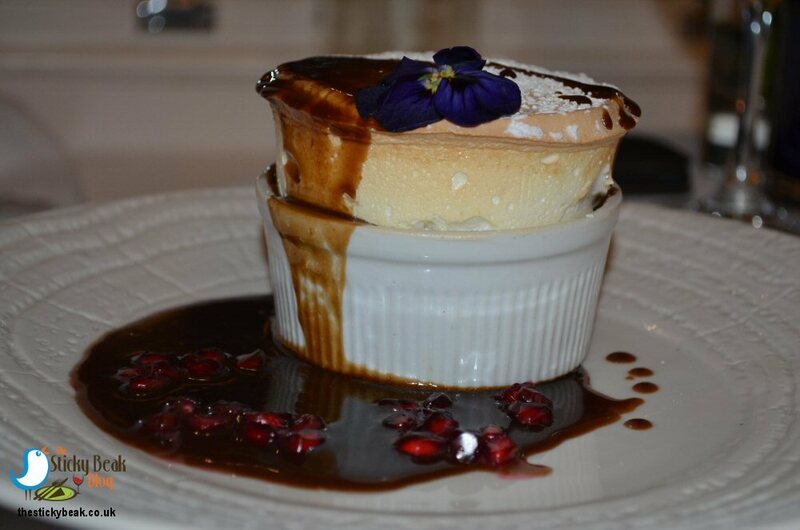 Very clever use of the Pomegranate seeds was evident in this dessert - their taste was barely noticeable, but they gave a marvellous textural component to the dish. I had an astoundingly good sponge on my hands (well, in my mouth to be precise! ); it was lovely and light in texture with an utterly perfect Chocolate taste. The indulgence really came from the rich, velvety Vanilla Fudge sauce. Oh my word, I could just eat this by the gallon; it is SO good. The Malt Ice Cream was just that- malty. It clearly takes it inspiration from Malteasers (yippee!) and Horlicks and that gorgeous flavour lingers lovingly on your tongue. Remember the coffee machine in the Bistro that I mentioned earlier? Well, it got put into action for us - you can’t enjoy such a fantastic meal as the one we’d just had without rounding it off with a good, freshly ground specimen. And it really was a fine brew; nice and rich, but rounded too, no bitterness to be found here. Hot Wings very well deserved by the team at The Orangery at St Elphins Park, Darley Dale.